Mr. Addy is the founder and chief executive officer of the Population Services International (PSI) Liberia program, and oversees the strategic direction and growth of PSI's newest platform. Mr. Addy is the founder and chief executive officer of the PSI Liberia program, and oversees the strategic direction and growth of PSI's newest platform. In this role, he has developed a strong partnership with the Ministry of Health and Social Welfare, and the Ministry of Youth and Sports, while initiating and building a strong relationship with PSI's traditional donors, as well as a respectable reputation in the development community. In the first three years of launching PSI Liberia, Mr. Addy secured over USD$5 million of diverse funding from UNICEF, UNFPA, and USAID. Through his leadership, he has positioned PSI Liberia as a platform sensitive to the needs of the people it serves, but also cognizant of the government's development agenda (the Poverty Reduction Strategy), working as an active partner to support it. 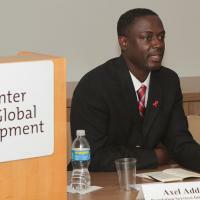 Mr. Addy holds a BA, from California State University, in Political Science with emphasis in Public Law, and an MA from UCLA, in African Studies with emphasis on International Development.